Given the beautiful day and friendly atmosphere it was, I thought, a perfect time to contemplate the world, my life and myself. Though the idyllic conditions would give an observer the impression that I’d had an easy time getting here. Like anyone, I suppose, my development from childhood into manhood had been filled with ups and downs. “Mostly downs.” I said to myself quietly as a runner jogged past. I carried an emotional burden but I consoled myself by recognizing that I’d led a normal life and my past couldn’t have been any more traumatic than anyone else’s. “Small comfort.” I thought as I dawdled and, on the outside at least, enjoyed the day and the walk. So it was that today I’d become introspective on a day when I should have been focused on the world around me. I shrugged off the odd feeling, and decided to enjoy the walk. In due time there was a bench at an inviting wayside, an area obviously unused by the people who had travelled the path and focused on moving from here to there. I sat for a bit, sensing the chill in the breeze and waved to the travelers. To my surprise, a lioness quietly approached and settled into a sunny patch. “Where are they going?” She asked. “I’m not sure, perhaps there.” I pointed to the village in the distance down the path, framed by the trees on either side. “It’s a pity that no one has the courage to read the sign.” Nodding. “We see more than we care to notice. The difference, is courage.” She insisted. The lioness just purred and relaxed in the sunlight. The lioness was right. I had become consumed with the signpost and attempting to unravel the mystery of its purpose. It seemed the more I determined that the path was the way to follow, along with everyone else, the more distressed I seemed to get. “No one will care, until they determine that you are crazy.” She interrupted. “Hmmm, I suppose, I’d miss the forest. Wait. Am I crazy? There’s no path at all, just a wall of trees and brush. ‘No.’ has far less danger, it’s safe.” Indeed, the forest undergrowth appeared especially thick and would be much better described as overgrowth. I could see that just a half-meter into the depths and there was barely enough light to distinguish the tree leaves from the vines. If there ever was a “Yes” path into the forest, right now I couldn’t detect one. “You can always change your mind, but that doesn’t mean returning to the path will be safe either.” She whispered. I only half heard her as I began to spread the bushes and attempt to find my first step into the dark. One step, then another I let a branch go that I’d pushed back. It slapped me on the rear as if to say, “Keep going.” Following no path into the forest, even just a few steps, wasn’t easy and I soon found myself covered it bits of debris, some long forgotten cobwebs and a bug or two. Turning, to look back for a moment, I found that after only ten meters or so into the depths I could no longer see the path, the sign or the lioness. The bush had closed in around me, warm and inviting but with the air of danger. My heart beat, hard. “Forward.” I thought I’d heard clearly whispered. After what must’ve been hours, glimpses of shadowy daylight began to randomly appear in the depths of the trees. I pushed on, now glazed with sweat and bits of the forest that had attached themselves to me, my body aching and bruised. The thick was getting thinner. Trees gave way to scrub and dangling vines. Two legs of bush opened wide to the daylight. The grass was green, still heavy with dew, and smelled sweet. Not like the musty smell I’d picked up in the forest. I found cobblestones. The stones were not laid out in a path but seemingly random. It was a semblance of a path and yet not a path. I looked carefully at the rocks. Each one lay as if it had dropped into position rather than being placed by a stonesmith. No, not a path at all, more like a field of rocks. Violets struggled to grow around the stones and it looked as though a painter had spattered the landscape with blue paint. On each rock was inscribed a single word. On some stones the weather had worn away most of the word and others it was clear. “Mysterious.” I sighed. But the going was easier and I moved away from the dark of the forest with a sense of having been birthed into light. Each stone greeted me with the same word and flowers making a stand for beauty. About 30 meters away at the gate to the cottage garden stood a woman. She was dark and plain, with raven black hair, but importantly she was hefting in her hand another rock. This one I caught with ease. I calmly walked toward her. “Neither. Today, I wander.” Stepping further forward. “Only on the outside.” I replied. “Ohhh! Confidence. Well, we shall see. Come in, come in.” She invited. “Did you lose these?” Offering her the rocks back. Confused, I let the comment go and stashed the rocks in my knapsack. “Take off your shoes.” She suggested. “Because, it feels wonderful” She said, pointing to her own bare feet on the deep dry red earth. The soil felt soothing, it was firm and cool and covered with the slightest bit of fine powdery dust, soon my feet were covered in it. We walked through an idyllic garden, finely trimmed with flowers in bloom…oranges, and yellows and reds dominated the fragrant space. Birds and butterflies lived here. The garden path was simply earth and it did indeed feel wonderful. We came to the cottage. It truly was out of a children’s story with a thatched roof, deep stone walls and a coolness that seemed to balance the heat of the Noon sun. On the front porch sat a table and two chairs. She led the way through the front door. I wiped my feet on the mat. Inside, the home was a simply appointed, but the space seemed as if it would expand beyond the bounds of the walls at every turn. I wondered to myself “How could a cottage have this much space inside?” It was cool and comfortable; the walls were white washed and furnishings wooden. There were many spots for relaxing and contemplation, comfortable niches with pillows and beautifully colored drapes, so thin they would whisper as we walked by. Walking down the main hall, each room seemed to invite me to stay. Inside the bath I found a door leading outside to a wooden tub brimming with hot water on a deck looking out over a beautiful tranquil vista. I left my clothes in the bath, stepped outside and bathed in the tub. It was a long luxurious bath that cleansed my skin and seemed to soak into me as well. I relaxed, listening to the birds sing and watching a hawk ride the wind over a distant field. The scene before me seemed almost impossible to have existed for it was a green valley stretching out before me and in the distance it appeared, as there might be a sea. On either side were ranges of small rolling mountains, covered in green. “This is impossible.” I said to myself. Hadn’t I just left the forest and the small glade of violet and stone? As the sun began to set, I rose from the tub and went back inside to the bath. My clothes had been replaced with soft silken robes woven in deep greens and blues. I found my way to the front door and could smell Jasmine tea and fresh baked bread on the front porch. She was there. She had been waiting for me. Her smile and slight rise when I approached belied no impatience, simply comfort. Now, having returned to the front porch of the mystical cottage, we sat and ate while watching the squirrels, birds and rabbits play, scamper and nibble in the garden and the glade. The very dark forest loomed as a backdrop, the sun slowly sinking behind us. “What brings you here?” She asked, and handed me a cup of tea. “What do they seek?” I asked, still not convinced I hadn’t wandered in to her by accident. “You tell me. What do you seek?” She smiled, softly. I sat puzzled and uncertain how to respond. In fact, I was uncertain how I’d even come to be here. I let the question hang in the cool fresh evening air. A long time passed, we sipped tea and ate bread in silence. A really long time passed. It was all so very quiet it seemed as if the squirrels and rabbits, the trees and even the wind held their collective breaths…waiting for an answer. “I guess, they’d be on a quest or a pilgrimage of some sort, looking for Truth.” I was sweating small beads. “Is Truth that fearsome? What do you fear?” Obviously having noted my discomfort. “Tonight, I fear the dark. Perhaps tomorrow, the light.” I obfuscated, fairly proud of myself for effectively dodging the question. “You are alone.” Her statement pierced me. Her eyes flashed and in the moment her posture was almost cat like. Tears began to well up inside me. I felt foolish. Why would I feel this way at such a simple observation? Indeed, I was very alone. Though I thought I was comfortable in not being connected to anyone, memories of people I’d known, now gone, people I’d estranged and people I had simply ignored in feigned indifference came to me like a flood. All souls I might have connected with, they were missed opportunities. Guilt. The flood moved through my heart and my mind sweeping out all the shells I’d built for years to attempt not to feel…pain. “Ah! The confident one feels pain?” She mused, almost taunting me. Red faced, I gulped down my embarrassment. It was hard to take a hit and not fight back, it was hard to feel the pain I’d avoided. But in her confidence and quiet I saw strength and absolutely no malice. “What would you think I’d feel?” I fought back. “Years, and it hurts to think about the loss.” I conceded. “But mostly…” I stopped mid sentence, contemplating. She waited. Silence ensued and slowly I began to weep. “A loved one?” She asked. “I suspect you know, that this is all about you, she’s not here…you are.” She brought me back. “So you feel pain. What’s on the other side?” She asked almost as casually as one might ask about the weather. “You will. It’s getting cold, lets go inside.” She rose, her orange, yellow and black gown flowing behind her. We walked back inside, now the front room had a warm fire lit on the hearth with furs and pillows laid out in front. “Sit. Relax.” She said. We sat on the floor in warm furs facing each other in front of the fire. There was the odd aroma of sage burning or possibly incense of some other herb. The room was dimly lit by the fire, which cast long shadows on the floor and walls. The orange glow embraced us. She appeared beautiful now. I felt silently ashamed that I’d thought of her as plain. Could this be an illusion of the incense, the low light and long shadows? No this was a stunningly lovely woman before me now and she seemed to get more so with every minute. I’m still not sure how the transformation happened, perhaps her beauty was there all along and I’d failed to notice! So many things in my life had been like that. Good things, lovely things that I’d let pass by simply because I’d failed to notice. “You feel remorse. You did not see everything, did you? You are forgiven. Breathe out all your ill will, regret and selfishness” Her eyes flashed orange and I felt … peace. Like a long low sigh, peace came upon me. It was the sort of peace that doesn’t care about the turmoil around it. A kind of peace that relaxed and knew, really knew it was all okay. She slid her warm hand inside my gown, gently laid it on my breast. I became acutely aware of my own heartbeat. She left it there for just a moment or two but what seemed an eternity. And when she gently pulled her hand away, I was secretly begging her to leave it there. My eyes naturally closed. “Destiny. I see…No! I FEEL destiny.” In fact in my mind’s eye I had seen the future. I knew it was the future, I just knew. But it had no form, just a purpose. I’d felt I’d been sent here. My purpose at that very moment was simply to be there. Why? I was unsure. In that moment of connection with another soul, it really didn’t matter. I saw or rather felt my destiny to connect. I would reestablish the connections I’d ignored for so long and starved my soul of companionship. Tears began to seep from my eyes. The odd thing was that I knew too, I knew that it was her life. Our souls were somehow entangled. Our feelings were known to each other. The depth of loss and the fullness of joy came to me in waves, riding high and powerful but crashing hard and receding slowly, leaving only shallows. “I am a sculptor, I live here in peace with my work.” Not the least bit irritated that she had repeated herself. We talked. For hours we talked. Like the flames of the fire burning brightly and hot then slowly dwindling into warm embers. It was all comfortable. We talked of loves and losses, we discussed matter and space and the energy that hold all four together. She asked about my dreams. I told her my secrets. The conversation lasted well into the night, not a string of yarns as a storyteller might shape, but a woven fabric bright with color and dark with mystery, a rich fabric that defined us both and entangled our lives. The patterns of that dialog were so deep that today, while I can barely recall the words, the feelings of those moments are vibrant. At the end as the coals turned to ash exhausted, I felt I could have wrapped myself in that conversation and been clothed forever, as richly as a prince. We left the great room and the cold hearth. Without a candle through darkened halls and up a stair, all black as pitch, she led me to a chamber. Again, I did not recognize the home or where I was, but it didn’t matter, for I was with beauty and love and truth. Entering the room, there was only starlight through the open French doors, which led to a small balcony. The air was cool. I lay on the bed deep in thought and wrapped in quilts. I yawned. She left. I noticed her lean frame dressed in her orange and black robes fade into the shadows. I was alone with my thoughts but rapidly asleep. Finally, rest and sleep. I fell deep asleep. I woke. It was dark, pitch dark. Disoriented, I rose, following a cold breeze and found myself standing on the balcony in the darkest of nights. Just the slightest wind blew, but there were no stars, no moon, no lanterns. Nothing. Just dark. I sensed electricity, yet there was no storm and I really couldn’t perceive clouds but I knew they must be there. Thick layer upon layer blocking out the night sky. Such unusual weather would normally have caused me to head inside and latch the doors. But I heard a distinctly familiar voice whisper, “Stay” I couldn’t quite identify the speaker, so low and soft and still so confidant. I could sense a presence. In a flash, the sky illumined. I was aware, really aware. I could see the valley and the sea beyond, I could see the trees of the forest in such detail I felt I could count the leaves. Brighter than Noon, this light was intense. But, I had no need to shade my eyes. It only lasted a second or two and slowly faded to black. Before it went completely dark I glanced at the porch below. There sitting facing me, watching me was the lioness and a tigress. A tigress with a vague familiarity. “I know this one.” I thought in the split second. As the light faded, just two pair of eyes remained. One green the other orange. Staring at me. Piercing, deep to my soul. The eyes hung in the dark for an eternity. I heard deep low feline purring. When their eyes finally faded, I returned to bed and slept as if I’d never wakened. Fast asleep, again. Sunlight streamed through the doors. I drowsed lazily, reflecting on the night, the day before, the forest and the path. It all now seemed very far away, almost lost in my distant past. Everything was just on the verge of remembrance. I was distinctly comfortable. The events had left me with no longing for past things or guilt for lost opportunities and relationships. I felt ready. On a small table along the wall was a tray with warm breads, cheese and a pot of tea. Next to it lay my clothes freshly washed, mended and neatly folded. I rose dressed and ate a leisurely, very silent, meal…simply reflecting. Down the hall, down the stairs, toward the back of the cottage and at the door I found my shoes and knapsack. I put them on and stepped out on to the porch. It was a beautiful day. The morning sun shone brightly and lit the valley in front of me in a new light. I could see a brilliance in the colors I’d not seen before and smelled the aroma of springtime. I felt like a new person. I felt released from the burdens I’d denied that I carried all these years, my step was light and I had the sense of adventure. As I strolled through the back garden I found a path that seemed to head straight for a back gate. I assumed this would lead me to the edge of the cottage grounds and out into the valley. As I approached I realized that the gate across the path blocked travelers from entering a sculpture garden. It opened easily for me. “This must be the woman’s work.” I said out loud, but to no one in particular. 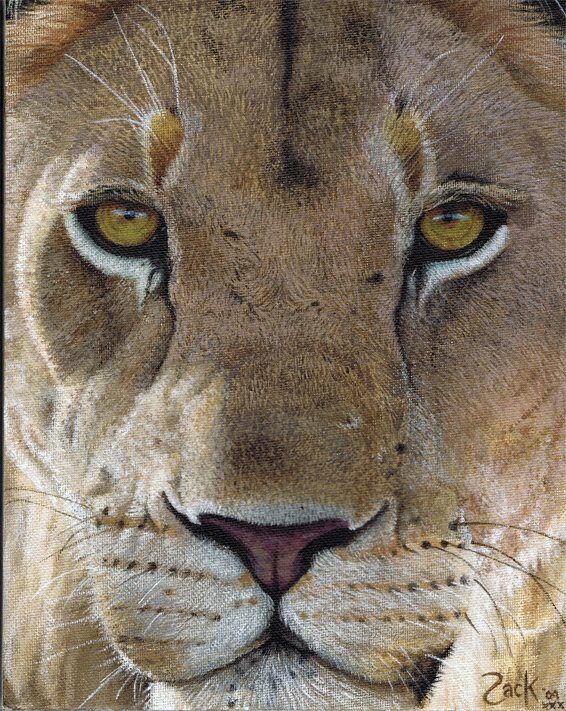 “It might be.” I heard the familiar purr of the lioness. “Relatives of yours?” I asked, almost joking. “We are all related.” She purred back. In the center of the garden I found an unfinished sculpture. A figure made of stone pieced together, obviously carefully fitted stones of random shapes. It was a three dimensional mosaic, capturing the variation in the color and shapes of the stones to convey the image of the sculptress. Even though the piecework was not finished it was unmistakably a self-portrait. I glanced around, expecting to see her here at work, but it was only the lioness and I enjoying the garden. There, directly in front of me was a spot not yet completed obviously missing four stones over the figure’s heart. My stones. The mosaic pieces in my hands fit perfectly into place to complete the figure’s chest. All of them fit “Love” side out. No mortar was required, no chiseling either. They just simply fit and immediately became a part of the sculpture. “Remarkable, it’s like she was waiting here for them. My burdens, she now carries in love. She and I are one.” I observed. It was a precious moment. The lioness said nothing for a very long time. “Did you meet someone?” She asked, breaking the silence. “I suspect she was chiseling on you.” She replied. Stunned, I sat down on a bench. I captured my breath. I took me some time to process it all. Had this all been a dream, was I in fact still dreaming? I just wasn’t sure. I rose, and we headed for an outer gate that clearly did lead to valley stretching out before us. “Do you think it was all real?” I asked the lioness. “That way.” I pointed to the far distance and the horizon.